Any chance of resaving these files as common-or-garden good old .jpg files, Mike? Thanks Mike for the updated images. In this instance, I think this is your solution, the A/R needs to work on this long stretch of single line, as long as that block is longer than the longest train to use it, and as long as you don't allow two trains to follow each other down it (or shunt onto it from opposite ends at the same time) that should work very reliably. To maximise the length of the A/R section you need to start it just outside the points as marked in green. Looks like you have another wye though, which looks much more problematical as you've not got a long run off one end, or on a wye leg, to handle it. I would use which ever leg of the wye is the longest, that looks like the section going down the centre portion of the layout, including the siding off it. The only problem with that is if two trains enter the two sides of the loop from different ends. That could solved by having another reverser on the siding track. On the other hand if the bottom right leg is as long as your longest train use that. I've put that in blue. You also have another problem with the wye from Rosenburg to the centre yard. Because that forms a loop to the right I think you have to put a reverser on the righthand leg. For maximum flexibility you may need to add a reverser on that loop section as well or else the if the whole loop was one section you would have to make sure no trains entered the right side of the wye as a train enters or leaves the centre yard from the loop. I've put this section in green. 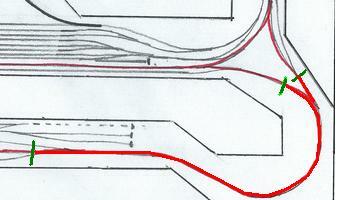 The shorter run from the yard doesn't matter as the two ends of the section match polarity. If not long enough extend the top of the section to the switch right of the crossing.